Mandurah Hunter Indigenous Business Chamber Inc (Mandurah HIBC) was established in the Hunter Region of New South Wales in early 2006. The Organisations founder and inaugural chairperson Deb Barwick identified the need for a culturally relevant forum for Aboriginal people and business owners to connect with each other, share ideas and experiences and access information, knowledge and resources to support their aspirations to run a business. During the first twelve months of operation Mandurah HIBC established strategic working relationships with Government and Industry Regulators, Training Providers and the Private Sector to create a One Stop Shop environment for Aboriginal Business Owners to network, access business training, mentoring and resources and contract opportunities. As the organisation grew from a Network and Facilitator of Resources to a leading Advocate for Capacity Building Programs and Supply Chain Opportunities, the demand for business mentoring and support services also grew. The organisations membership continued to grow as new businesses from outside the Hunter and neighbouring regions joined. 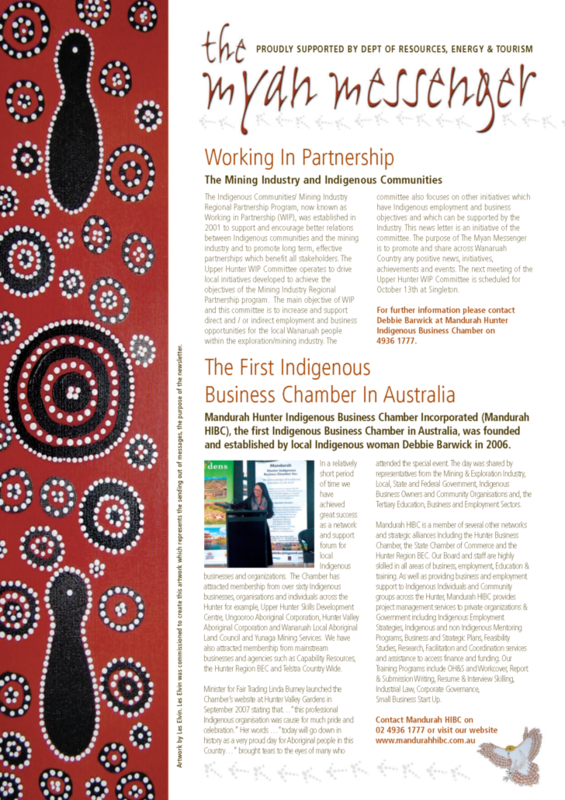 In 2008, the Mandurah HIBC Chairperson and a large delegation of Aboriginal Business Owners were invited to Canberra to discuss the Chamber Model as a grassroots initiative that could significantly increase the numbers of Aboriginal people participating in the economy as business owners and therefore build a pipeline of Aboriginal Suppliers. In 2009, Mandurah HIBC registered the NSW Indigenous Chamber of Commerce (NSWICC) which was formally launched 18 months later. That same year, Mandurah’s Chair was invited to Canberra again to discuss the Chambers important role, but also the establishment of an Australian Indigenous Minority Supplier Council (AIMSC, Now Supply Nation). 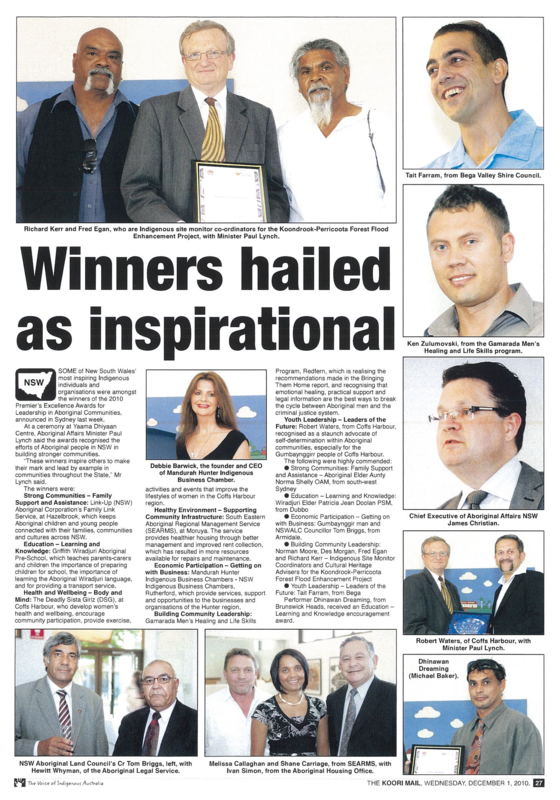 Mandurah HIBC was formally recognised in 2010 for its significant contributions to enabling economic outcomes for Aboriginal people and communities in NSW when the Chairperson and Board were presented with the NSW Premiers Award for Excellence. 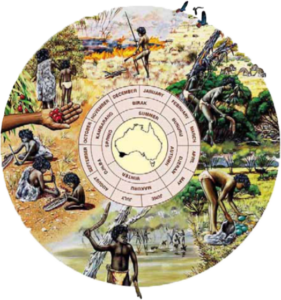 The following year, Senator Mark Arbib addressed the launch of the NSW Indigenous Chamber of Commerce (NSWICC). With over 300 guests present, the Senator announced his Government support for a National Indigenous Chamber of Commerce Network. Mandurah HIBC’s success as Australia’s first Representative, Network and Advocate for Aboriginal-owned businesses is celebrated today by a national network of State and Regional Chambers representing the voices of over 4500+ Business Owners. The NSW Indigenous Chamber of Commerce (NSWICC) continues the legacy of Mandurah HIBC however to this day the Indigenous Chamber of Commerce Model is not funded.